Chargebacks and deductions from retailers are becoming an increasing issue for consumer packaged goods manufacturers and distributors. As retailers get more automated and sophisticated, they are able to take rapid-fire chargebacks and deductions against manufacturers creating enormous paperwork and processing problems, and cutting into hard won revenue. DeductionsXchange elminates deductions and chargeback processing by resolving and disputing for CPG manufacturers and distributors. 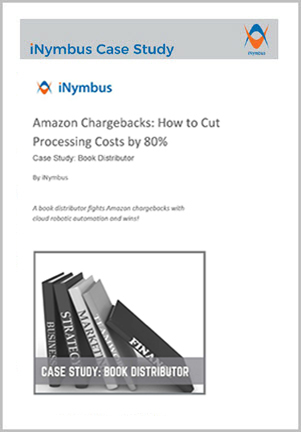 iNymbus introduces cloud robotic process automation for automatically reading retailer portals, gathering and preparing deductions and chargeback paperwork, packaging claims and then uploading denied claim packets to vendor portals. Efficiently gather all claim documentation automatically. Seamlessly organize all claim documentation per audit or retailer requirements. Provide business partners with instant access to claim documentation. Upload denied claim packets to vendor portals or send via automatic emails, fax, or print and mail. Laser focused on chargebacks and deductions, with overarching goal of processing them quickly and efficiently with limited human interaction. Cloud data storage combined with robotic automation applies latest technology and thought leadership to retail deductions and chargeback processing problem. iNymbus can take in any type of data input– PDF, data files, extracts from receivable systems, vendor portals, Excel files — and manipulate this deductions and chargeback data into the format required by individual retail portals. DeductionsXchange processing implementation is personalized for each company’s chargeback and deduction needs, as no two companies have exactly the same processing situation. 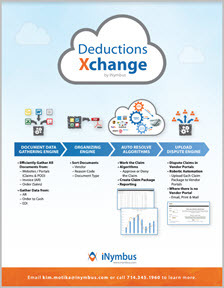 DeductionsXchange will reduce deductions and chargeback processing costs by over 80%. The speed of processing deductions and chargebacks will be increased by an astounding amount. What previously took a clerk over a week to process, will be handled in an hour (40X processing speed increase). Days Deductions Outstanding (DDO) will be reduced by 30% to 50% depending upon how behind the manufacturer has gotten in processing deductions & chargebacks. Invalid deductions and chargebacks caused by deductions and chargeback processing problems will be eliminated. 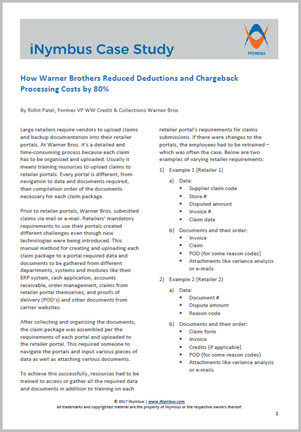 Many companies report seeing a 10% increase in deduction/chargeback recovery rate. Retail portals will continue to change and with new requirements for processing, as much as quarterly. DeductionsXchange evolves and learns constantly, and continues to modify its own processes, eliminating the need for CPG manufacturers to stay abreast of retailer requirements in the deductions arena. Company’s I.T. department is not needed assist with data manipulation and processing. Once private data exchanges are set up, the iNymbus process can run on its own with no human intervention, constantly culling necessary documentation, creating claim packets and submitting claims upon CPG company’s behalf. DeductionsXchange process automatically scales up and scales down with the amount of volume in deductions and chargebacks incurred by the CPG company. Seasonality creates absolutely no impact. The Collections team can actually work on exceptions and resolve real business process issues, rather than managing paperwork created by onerous deductions processing requirements from retailers. DeductionsXchange can work with any retailers including Walmart, Amazon, Bed Bath & Beyond, Target, Kohl’s, J.C. Penny, Fedex, UPS and many more.